Synopsis: In 1995, CIA/FBI jointly discover plans to recover a trove of priceless treasure from deep below the North Atlantic Ice Barrier, aboard RMS Titanic. Ultra-zealous terrorist divers compete against others, and set off a complex web of international intrigue and suspense. CIA’s Colonel Bramson recruits Dr. Cary Parker, Woods Hole oceanographer / archaeologist, to beat both teams to Titanic’s grave. And a wave of worldwide terrorism is set into motion at 2077 fathoms, as a rare, priceless book and lost treasure becomes the primary focus of a triadic search. Parker, challenges the terrorists on his own turf, and what follows is an epic adventure of legendary proportions. Who inspired you to become a writer? My mother set an example for me. In 1970, she published a series of small books that documented the history of the now beatified monk—Father Junipero Serra—and his journey throughout the state of California, to establish Catholic missions. Written in sonnet form, her books were used as the basis for producing spectacular pageants, throughout the State of California, in celebration of its Bicentennial. Copies of “Sonnets to Serra” now reside at the Vatican library in Rome. During nearly thirty-five of my earlier years, I had been writing pretty much for myself or, as owner of my own advertising and marketing firm, under client contracts. Years of writing copy for regional and national advertising markets—and for public relations campaigns—rounded out my ability to express my ideas. Privately, I started with poetry and lyrical works—eventually encouraged and inspired by Illinois’ Poet Laureate and Pulitzer prize-winning poet, the late Gwendolyn Brooks. Ms. Brooks volunteered to personally review my poetry over dinner and lunch, one weekend, to discuss her favorites. During our time together, she also offered suggestions to improve several others. Further encouragement came from an old friend, who recently passed away… renowned composer-pianist, Roger Williams—the first pianist ever to receive a gold record. On two occasions, Roger attempted to get my more lyrical pieces published within the recording industry. But times had changed, by then, and he reported my work was considered “too romantic”, for that moment in time. Additional inspiration came from studio executive and comedienne, Lucille Ball. While working in post-production, at Desilu Studios, I wrote a script for “The Lucy Show” (not the original “I Love Lucy”). She personally read the script, rejected it, but told me not to give up writing. While I was artistic-producing director for the Lucille Ball Studio Theater, she continued to encourage my creative abilities. As a member of the National Speaker’s Association and International Platform Association, I was first published in an anthology titled “Star Spangled Speakers”. In the book, officially dedicated and presented to President Reagan, was a copy of my speech on decision-making. Following on these experiences, I decided it was time to move on to larger literary pursuits. My first novel is actually my second. The original, a science-fiction fantasy thriller, was put on hold when the idea developed for my suspense-thriller—OMAR. OMAR had a blast of sales in the spring and summer, earning it bestseller status on Amazon. You can help get the book back to its former glory by spreading word of this wonderful thriller. This can best be done if you have a blog, especially a blog about books. 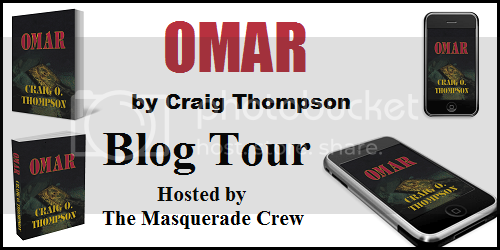 If you are a blog tour host with The Masquerade Crew, your invitation to help Craig will be sent to you soon (if you don’t already have it). If you aren’t a tour host for The Masquerade Crew yet, go to THIS PAGE to sign up. If you don’t have a blog, you can still help. Spread the word via Twitter and Facebook and anywhere else you hang out online.